Many homeowners enjoy having pets but they are a lot of responsibility. You have to feed them, play with them and let them outside. With a multitude of other responsibilities, it could be very difficult to make time caring for a pet, but we have a solution to make your life easier: pet doors. They allow your pet the ability to get outside when you aren’t available. That being said, there are a few things you’ll need to know before getting a pet door. This article will help you understand everything you need to know about pet doors. First you should decide which pet door style would best suit your home. You’ll want to consider each style based on your pet’s size and each door’s features before making a decision. Everyone has seen a traditional flap pet door – it’s a classic! They are durable and easy for your pet to use. They also can be used on interior doors in your home. There are concerns pertaining to intruders but if the traditional flap is installed leading into a garage or locked patio, you should be fine. Hard plastic doors come with an added locking feature that will prohibit use of the pet door. There is a slot on the inside of the pet door where you can slide the lock which is a plastic cover. This will prevent wild animals or intruders from entering your home. Unfortunately, this also means your pet using the door as well. If you’re interested in the hard plastic lock, its best to use it when you’re sleeping. While is does take away a little bit of your pet’s freedom, your home is safe for the six-eight hours you are asleep. Magnetic or electric doors work with your pet’s collar. They will only open if your pet is wearing the collar and attempts to go through. This will prevent any other animals from getting into your home, but they’re more expensive than traditional doors. It might be more difficult to train a pet to use the magnetic door because they can only use the door with the collar. Pet doors are for the convenience of the owner and the pet. So it would make sense that there are several variations of pet doors that can be installed in different locations of your home. No matter where you want it, almost anywhere can have a pet door installed. Obviously, exterior doors are the most common place pet doors are installed. This allows your pet to go outside. Pet doors aren’t limited to exterior doors though. Installing a pet door into an interior doors allows your pet to leave and enter different areas of your home. This is great for late at night if your pet needs to get a drink. Rather than keeping a water dish in your bedroom that you may trip over when you’re half awake in the morning, your pet can go out of the bedroom and get a drink in the other room. The placement of your doors no long effect where you put a pet door. In the wall pet doors allow you to install them anywhere around your home. While the installation process is complicated because you have to worry about foundation and insulation, this freedom is attractive to many homeowners. If you don’t want to drill and saw into your exterior doors or walls but would like the luxury of a pet door, in-glass pet doors are a great solution. They come as inserts for patio doors that can slide into its track. While they don’t take away from the look of your beautiful patio door, they can be much more expensive than other options. You also have the option of built-in glass pet doors. If you have screen doors, there are specific pet doors for you. They are similar to the in-door pet doors but you will need to cut a hole in your screen. It will allow you to enjoy the ventilation of your screen door and the luxury of a pet door at the same time! Pet doors aren’t made for pets of all sizes. You will need to take measurements. The best way to do this is by starting with the width. 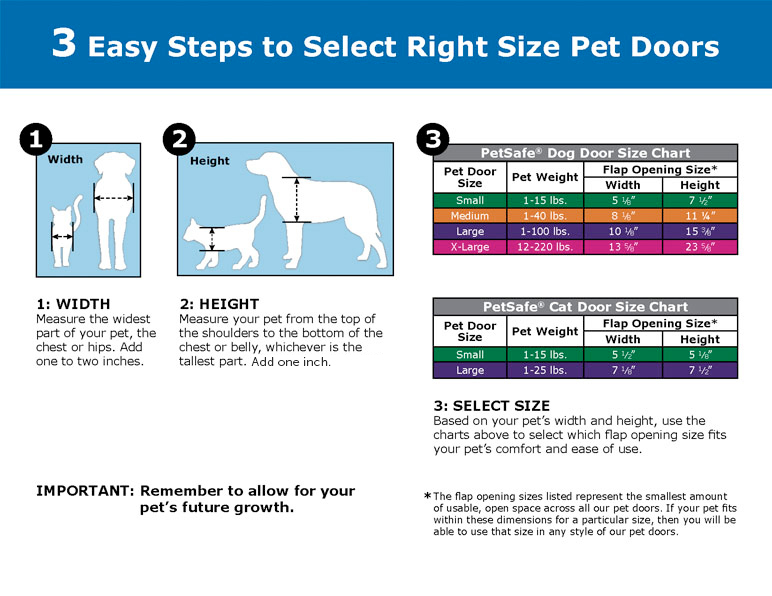 Facing your pet, measure the chest or hip (the largest part of the your pet) from one side to the other. Add two inches to your total for a buffer. For the height, measure from the shoulders to the chest and add two inches. You want there to be enough room so your pet can comfortable fit through the door without struggling. If your pet is young, don’t forget to allow room for growth. Now that you know what style of pet door you want, where you want it and the size of your pet, it is time to begin the installation process. The installation kit you choose changes based on style and location you want. In fact, the location of your pet door can completely change the entire process. Warning: if you don’t feel comfortable drilling holes and sawing into your door or wall, there are professionals who can assist you with the installation. Installing a pet door to any door can be pretty easy. Start by making sure you have a pet door kit for the correct style, pet size and location. Remove your door from its hinges and use the stencil inside the kit to drill holes in each corner. Make sure the stencil is placed about four inches from the base of the door so your pet doesn’t have to squat to get through. Then, draw a line connecting each hole. From there, use a jigsaw to cut around the drawn lines. You’re now ready to fit the pet door into the hole. There is a video that will help you through the installation process below. Screen pet doors install much like exterior pet door with one exception. You will need to cut the screen with a pocket knife. Make sure you’re using a screen door specific pet door kit other wise you won’t have the proper tools, pieces and instructions. In-wall pet doors are much more complicated to install than the locations. You’ll have to worry about your home’s exterior, insulation and structure. If you aren’t comfortable handling this type of project, we highly suggest hiring a professional. That being said, don’t be scared to get an in-wall pet door. They give you the freedom of putting a pet door anywhere around your home. What if you want a pet door in a glass sliding patio door. You can’t cut the glass around your door because it will shatter. The solution is getting a sliding patio door insert pet door. They can fit right into the sliding track. While the sliding patio door inserts can be expensive, they allow you to get a pet door without cutting or sawing into your wall or door. There are also built-in glass door pet doors. These can be installed like a normal exterior door. Like most new things introduced into their lives, pets don’t think to use the pet door right away – some are even afraid of it. With a little training though, you’ll have them going in and out no problem. The best way to get them acclimated to using a pet door is to introduce them to the opening without the flap first. Hold the flap open and coax them through with their favorite treats. It does help to have a person on each side of the door so the pet is reassured it’s okay. As your pet feels more comfortable passing through the opening, slowly introduce the flap by lowering it a little each time your pet goes through the door. Continue reassuring and encouraging them with treats. Having a pet door is beneficial to both you and your pet. It opens up more possibilities and takes away stress. Owning a pet is a huge responsibility. With work, family, your home and other errands, you can be a very busy person. You don’t want your pet to suffer being cooped up all day. The pet door gives your pet easy access to your yard or another fenced in area. Pets have to live by your schedule. They eat when you feed them, they play when you want to and they sleep when you sleep (for the most part). Why should they only go out when you let them out? Sometimes a pet has to use the bathroom or has extra energy to burn but you’re no where to be found. That isn’t fair to your pet. Giving them access to your yard allows them to safely go about their business. Even though pet doors are a great addition to any home, there are a few safety precautions you should take after one is installed. There are two important aspects to keep in mind when it comes to your pet’s safety: is the pet door the right size and does it exit into a safe area. If your pet door isn’t the right size, your pet could hurt itself trying to force itself through the opening. Their legs and back may become strained in the processes. Make sure the opening is large enough for your pet. Give them a buffer on each side. If the door doesn’t exit into a safe area, your pet could wonder too far from your home. Your pets are still animals and have instincts that they involuntarily act upon. They will chase other animals and people. Make sure they can’t get too far by having an area fenced off. Your pet isn’t the only thing that can fit through a pet door. You have to watch out for small children getting out. When they learn to crawl or walk, children become very adventurous. Having a hard plastic lock is the best way to prevent your child from crawling through your pet door. Intruders and creatures are a threat with pet doors. Installing your pet door in a fenced in or locked area is crucial in preventing unwanted visitors. A hard plastic lock is another way to ensure nothing is getting into your home. Pet doors are a fantastic option for any pet owner. They give your pets more independence and reduce the stress for you. There are many options in style, locations and safety precautions to keep in mind, but hopefully you are now armed with everything you need to know about pet doors.